Hot on the heels of Apple’s less-than-dazzling entrance into the streaming market Spotify made two big announcements: a further $526 million in funding and 20 million paying subscribers with 55 million free users. Not a bad retort. Between December 2014 and June 2015 added an average of 2 million free users a month and 1 million paid users a month. 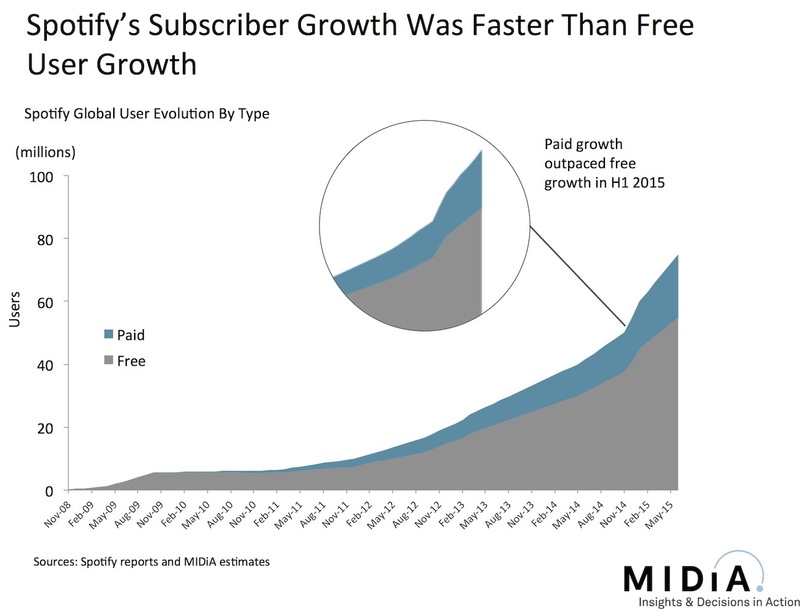 Although this meant Spotify’s free user base added twice as many users (10 million compared to 5 million) paid users grew faster in percentage terms, increasing by 33% compared to 22% for free. These numbers can, and will, be taken to support both sides of the freemium argument and things are complicated by the fact that Spotify’s free user base is probably higher than 55 million. However the key takeaway is that based on the publically available numbers subscriber growth was faster than free growth in the first half of 2015. Spotify was already the most heavily financed music service in history and it has nearly doubled its total investment in one single round, taking the total to more than $1.1 billion with a valuation of $8.5 billion. That translates to $55 of investment per subscriber. Or on a valuation basis $425 per subscriber which would take 3 and half years of continual subscription per subscriber to recoup in headline revenue terms. However as Spotify only gets 30% of revenue it would actually need 12 years of subscription per subscriber to generate $8.5 billion. Of course VC funded company valuations are more about potential than they are realised value so the comparisons are slightly unfair. But given that $8.5 billion represents 57% of the entire global recorded music industry revenue in 2014 there are some pretty big assumptions being made. Make no mistake, Spotify has established itself as the global leader in its space and has good reason to feel confident. However Apple has so many structural advantages (owning the platform and billing relationships, massive addressable base etc.) that it is still likely to become the global streaming leader 3 years or so from now. (Assuming of course it ups its game from its entry product.) But that does not mean Spotify cannot be a success too. Apple entered the download market when none of the existing stores had any meaningful customer base. Even with that supreme head start Apple still only managed around a 65% global market share of the download business. Granted most of the competitors were bit part players but in the streaming arena it is entering an established market with proven customer bases. This will not be a winner takes all market and I fully expect Spotify to be closer to Apple than Deezer (the current #2) is now to Spotify. These are big numbers from Spotify that prior to Apple’s announcement it probably thought it would need even more than proved to be the case. Regardless, both sets of figures show that Spotify is geared up for a fight for supremacy. Game on! This entry was posted in Ad Supported, Apple, Spotify, Streaming, Subscriptions and tagged Ad Supported, Apple, Music Subscriptions, Spotify, Streaming, Streaming Music, Subscriptions by Mark Mulligan. Bookmark the permalink. But how many of those new ‘paying subscribers’ are just paying £0.99 or $0.99 for a 3 months’ introductory discount period, which probably brings in less revenue (and pays less to rights-holders) than the ‘free’ tier? “Spotify Is Now Worth More Than Half Of the Entire Global Recorded Music Industry” – uh, no. They’re worth half the YEARLY REVENUES of the industry. Very different things. If you applied a simple 10x revenues to the industry it’s worth 150B or so. Spotify only 5-6% of that. What time frame are you referring to when you say “Apple still only managed around a 65% global market share of the download business”? It’s share of downloads in the U.S., either for songs or albums, was much higher than that. Does Asia’s fast adoption of mobile as a music platform help explain the contrast between Apple’s U.S. Share and your estimation of its global share? Pingback: Darrell Haynes Music – What is Spotify Doing Now???! !